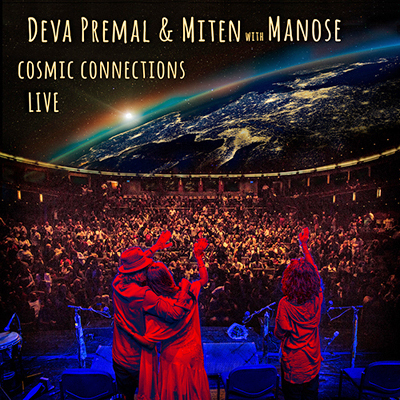 Cosmic Connections–Live was recorded by Deva Premal & Miten with Manose during their 2014-15 World Tour, and offers an opportunity to experience the transcendent energy of their live concerts. The album begins and ends with Deva’s haunting rendition of the timeless and mysterious mantra OM (Deva & Miten call it the ‘Cosmic Yes’) and what lies between is an enchanting journey into mystic realms. Ancient mantras embedded in East-West fusion soundscapes soar on luminous notes of the bansuri, courtesy of Nepalese maestro Manose, weaving elegantly with intimate and deeply moving ballads from Miten. The trio are joined on this inspired collection of mantra and song by a roster of master musicians, notably Joby Baker [bass/percussion/vocals] and Spencer Cozens [piano/keyboards], as well as their concert audiences in Budapest, Frankfurt, Edmonton, Bath and Amsterdam. Deva & Miten see their music as an invitation to take a break from the turbulence of our troubled times and open into a space of inner peace and meditation. This new release is another beautiful bridge to cosmic connections.